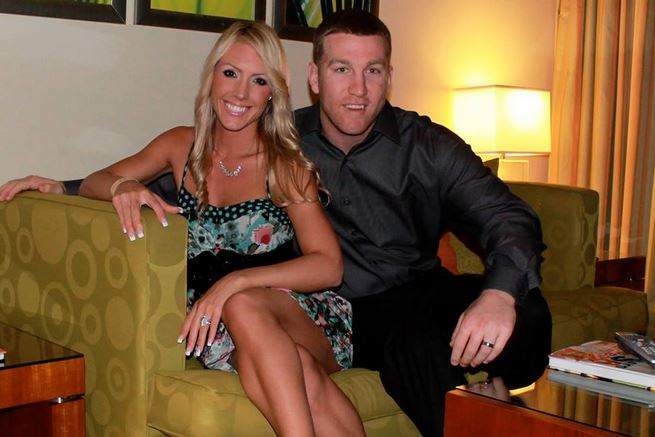 Todd Brian Frazier was born on February 12th, 1986 on the Jersey Shore in Pt. Pleasant, New Jersey. He is of Scottish Ancestry & has the nick name "the Todd Father". He grew up in Toms River, New Jersey & was part of the 1988 Little League World Champions dubbed the "beasts from the East". The team had won the state Championship getting to the Williamsport Little League World Series where they went undefeated, beating the International-champion Kashima Little League from Kashima, Japan. Frazier was the star of the team & that final game where he was the winning pitcher, sealing the 12-9 win with a strike out. He had started the game at short stop & went 4-4 at the plate, leading off with a HR. 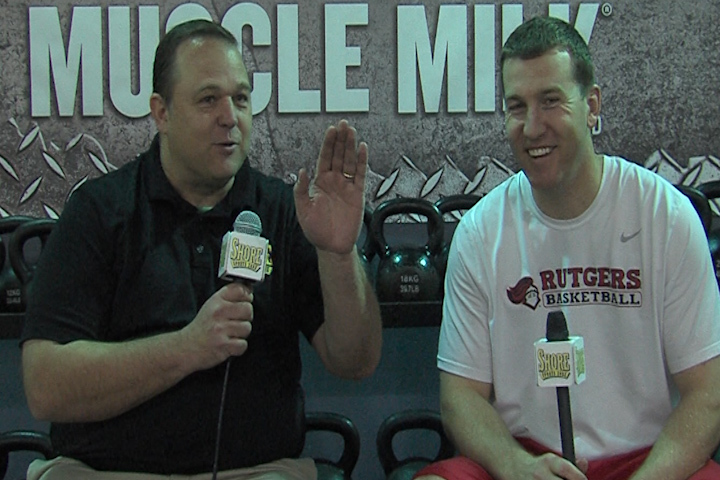 Frazier later attended Rutgers University where he won the 2007 Big East Player of the Year Award. That year he set records in HRs runs scored (87) doubles (24) walks (62) & total bases (187) while batting .377 playing in all 63 games. He was third in RBIs (65) fifth in hits (93) & tied for sixth in steals (25). He became the third player from Rutgers to get drafted in the first round as he was picked by the Cincinnati Reds. 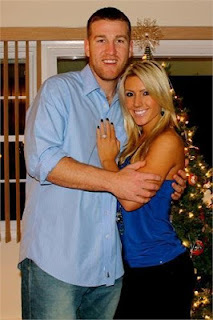 He spent five seasons with the Cincinnati Reds, debuting on May 11th 2011. Two games later he doubled & drove in three runs for his first career RBIs. In 2012 he came in third in the NL Rookie of the Year voting with 19 HRs 67 RBIs & batting .273. 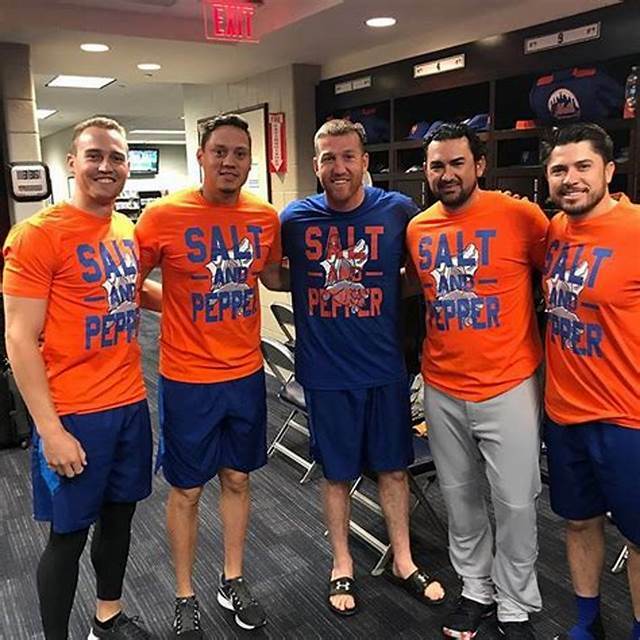 In a May series against the New York Mets he belted two HRs at Citi Field one off Johan Santana & one off DJ Carasco thrilling his family & friends in attendance. He had a great August winning him the NL Rookie of the Month award. He would spend five seasons with the Reds making the 2014 All Star Team & getting to two post seasons. In 2012 he drove in a run going 1-6 in the NLDS loss to the San Francisco Giants. In 2013 he doubled going 1-4 in the Wild Card game loss to the Pittsburgh Pirates. 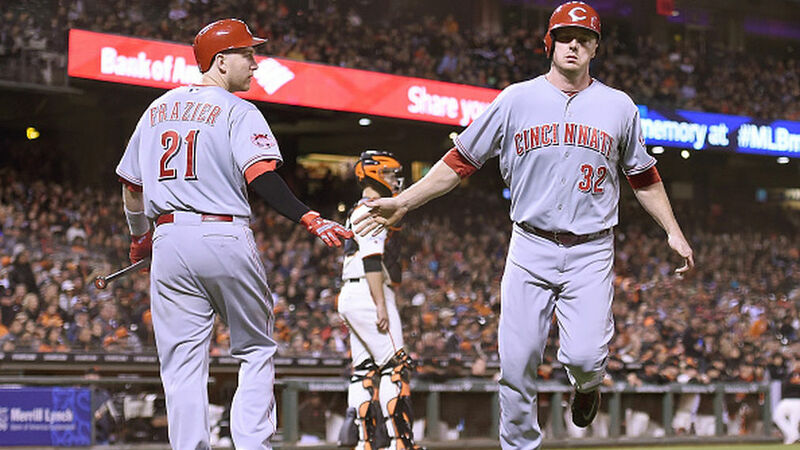 2014 All Star Game: He was a huge hit for the fans, in the 2015 Mid Summer Classic playing for the Reds, while starting at third base as the game was held at Great American Ball Park in Cincinnati. He was the All Star Game spokesperson & won the HR Derby as well. He was the first hometown player to win the derby since Ryne Sandberg did it in 1990. He won the NL bracket of the derby the year before, losing to his now Mets team mate; Yoenis Cespedes. Frazier went 0-3 in the 6-3 NL All Star loss. That year he hit his first grand slam HR, while slugging his way to a career best up to that point, 35 HRs with 89 RBIs & a career high 43 doubles. Frazier has always put up decent on base % & slugging %, that year he had a career high .498 slugging %. In December of 2015 he was part of a three team trade that landed him with the Chicago White Sox. In Chicago in 2016 he hit a career high 40 HRs & had career highs in RBIs (98) & runs scored (89). 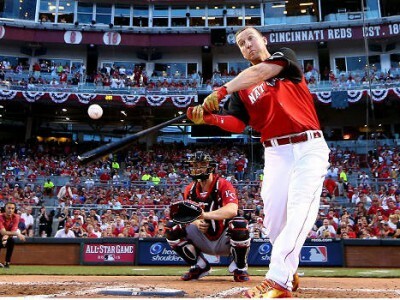 The slugger once again was a star in the HR derby coming in second place to Giancarlo Stanton. 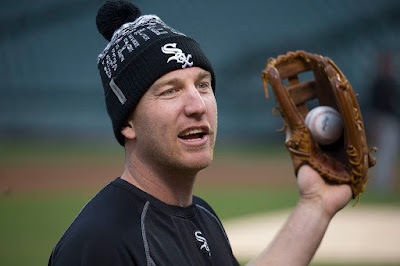 After the season he signed a one year deal to play with the White Sox again. In late July he was traded to the AL New York team whom he had grown up being a fan of. For the year his average fell to .213 but hit 27 HRs with 19 doubles & 76 RBIs in 147 games. 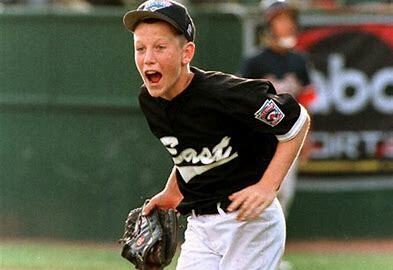 He ended up getting to the ALCS where he hit a three run HR in Game #3. He & the team would eventually lose to the World Champion Houston Astros. In February 2017 he inked a two year $17 million deal with the New York Mets. He was the solution to the Mets third base woes since losing David Wright to his ongoing back injury. 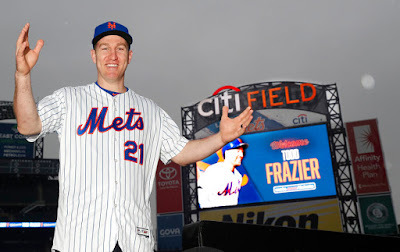 Mets Career: Frazier got the Opening Day start playing third & batting fifth. He got one hit in the Mets Opening Day win. 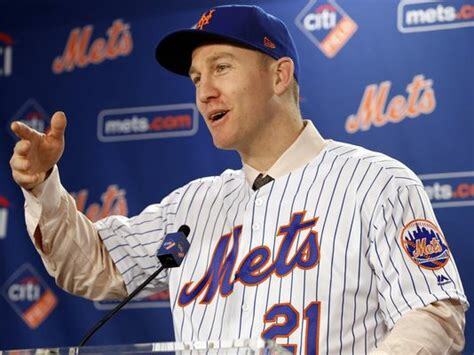 The next day, he delighted the fans with a 1st inning two run double, then added a sac fly RBI later in the Mets 9-4 win at Citi Field. He would collect two hits & drive in a run two days later in the Mets 2-0 win over the Phillies. 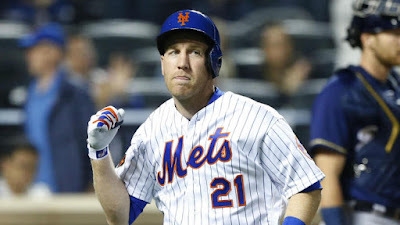 On April 13th, he hit two HRs in the Mets 6-5 win over the Milwaukee Brewers. In the Mets ten game win streak to start out the year, Frazier had five RBIs with nine hits. Trivia: He is the originator of the Mets salt & pepper trademark, the twisting of both hands as turning a pepper grinder, after reaching base with a key hit. Unfortunately there wasn't much more of that as the dismal season went on. He peaked at .313 but then his hitting fell off. He closed out April with 4 HRs &17 RBIs. On May 8th he suffered the first hamstring injury of his career, he would miss a month of action. 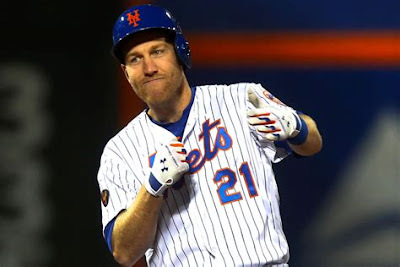 In June he hit two HRs in that years version of the subway series, including driving in both runs to hurt his old team in Seth Lugo's 2-0 Mets win on June 10th. He then drove in runs in three straight games at Coors Field in Colorado. In July he suffered a rib cage injury & went down again, missing almost another full month of action. After his return he had a nine game hit streak, where he drove in ten runs. On August 15th in the Mets 16-5 blow out of the Orioles at Camden Yards, he collected three hits, a HR & drove in four runs. By mid August his batting average fell almost below .200. In late August Frazier hit HRs in three of four games, then on August 29th, he hit a grand slam HR at Wrigley Field in Chicago in a 10-3 Mets win. He had two hits with five RBIs on the day. An uneventful September had him have another multi RBI game (4) but hit just two HRs in the month. 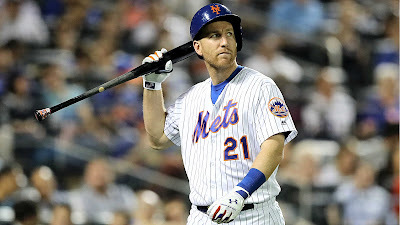 A very disappointing season ended up with Frazier batting a dismal .13 with 18 HRs 18 doubles & 59 RBIs with a .303 on base % in 115 games. He struck out 112 times with 48 walks. In 109 games at third he posted a .959 fielding % with 12 errors & 28 double plays turned. In a eight year career he has 907 hits with 193 HRS 183 doubles 557 RBIs a .242 batting average & a .319 on base %. With the slugging comes 931 career strikes outs. He has played in 1053 games, 917 at third base & 94 at first base but none at that position with the Mets. Family: Frazier has two brothers who have played minor league baseball with his one brother Jeff playing nine games at the big league level with the Detroit Tigers. Todd married his long time girlfriend Jackie a Jersey girl & former Rutgers gymnast. Together they have two children & live in Toms River, NJ. The town's little league field is now named after Frazier. Trivia: Todd is a big fan of fellow Jersey Boy, Frank Sinatra & has Sinatra music play when he usually comes to the plate.